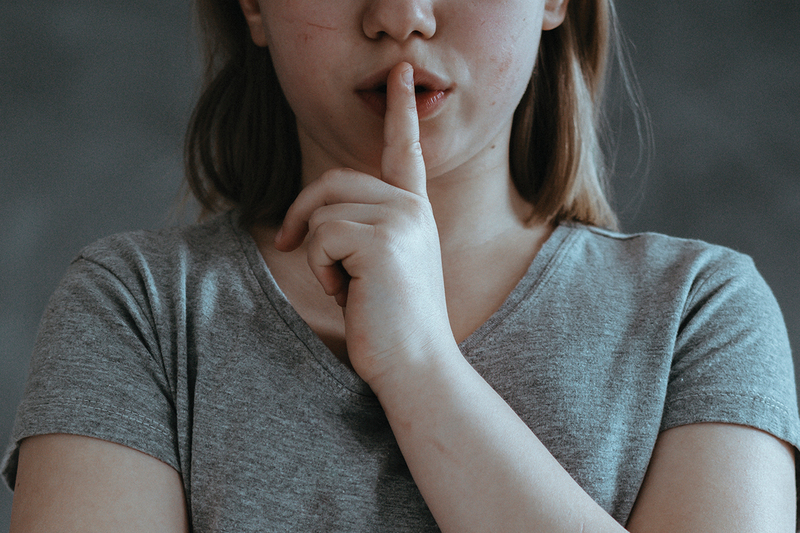 Ashley Wroton, a licensed professional counselor (LPC), says parents of her young clients have told her that pediatricians sometimes make comments suggesting that they try “real” therapy with their child rather than play therapy. The idea that play therapy isn’t a wholly serious or legitimate approach to therapy is a misconception with which play therapists often contend — including among other helping professionals, says Jeff Cochran, a professor of counselor education and head of the Department of Educational Psychology and Counseling at the University of Tennessee. Perhaps understandably, those not trained in the theory might be skeptical of the effectiveness of allowing a child to explore a room full of art supplies, stuffed animals and toys for the length of the therapy session. 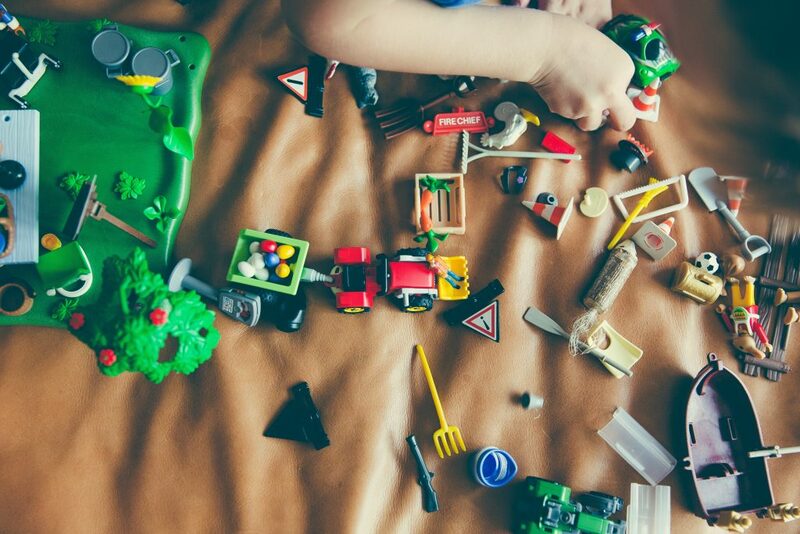 However, Cochran explains, under the watchful eyes of a play therapist, the toys are a medium through which the child communicates, learns, self-discovers, shares experiences and forms a trusting therapeutic relationship. The play, he asserts, serves simply as a bridge to therapy. “Because we refer to it as play, [people assume] it’s supposed to be all light and easy for the child. But, no, it’s work,” says Cochran, a member of the American Counseling Association. Under the broad umbrella of play therapy are a number of focused methods and approaches, ranging from child-centered, filial and dyadic to animal-assisted play therapy. Although most often associated with children, play therapy can also be used in varying forms with teenagers and adults, as well as with children and their parents or their caretakers together. It can also be used in conjunction with more traditional therapy methods such as cognitive behavioral, Adlerian, Gestalt and narrative therapies. However, simply having some toys in a therapy office or encouraging clients to draw or play with blocks as they talk with a counselor is not play therapy, stresses Dee Ray, an LPC and director of the Center for Play Therapy at the University of North Texas. The 2014 ACA Code of Ethics emphasizes that practitioners should undergo “appropriate education, training and supervised experience” to become fully competent in a specialty area such as play therapy before using it in practice. Practitioners can also obtain special play therapy credentials (such as the registered play therapist credential) through training, supervision and other requirements. 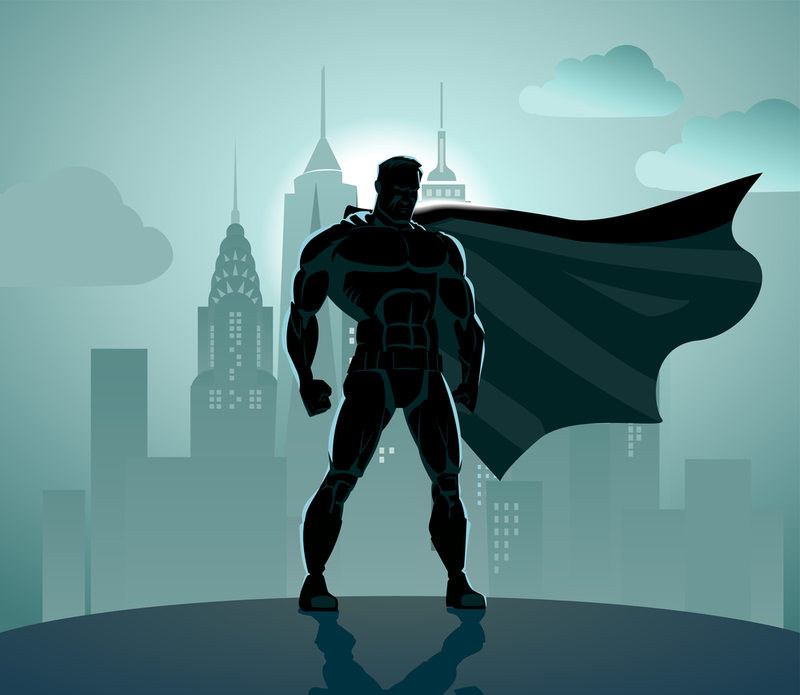 These credentials provide practitioners additional credibility and may be preferred by certain employers or clients, Ray explains. Play therapy generally begins with a period of observation and assessment by the counselor, followed by work to process and focus on challenges the practitioner has identified based on cues the client exhibits during play. Wroton starts therapy by talking with her child client’s parents or caregivers to hear what they believe the presenting issue is. After first watching the child play on his or her own, Wroton conducts a session in which the child and adult caregivers (or other family members living in the home with the child) play together so she can observe how they interact. Afterward, she talks with the parents or caregivers about what she noticed. Play therapists learn much through observation, including how the child handles separation from the caregiver when the child is brought into the therapy room, Wroton says. Some children are clingy or start crying when the parent leaves, whereas others don’t seem to mind at all. This provides play therapists cues about the child’s level of attachment. Other cues can be found in how clients play with objects in the playroom. For example, clients with anxiety, obsessive-compulsive behaviors or control issues are often very structured in their play, Wroton says. They might engage in organizing behaviors rather than playful play. She remembers one young boy who gravitated toward arranging the stuffed animals by category: jungle animals, farm animals, aquatic animals and so on. At the same time, Wroton says, practitioners need to watch from session to session to see if clients’ play behaviors change at all. At first, organizing behaviors might be a way for clients to soothe themselves or to create order because they’re nervous. But if those same behaviors continue across sessions, they could be an indication of anxiety, autism, past trauma or other issues. Most important, each client in play therapy will need a tailored approach and a different degree of involvement from the counselor, Wroton says. She notes that some of her clients are very independent while playing, hardly making eye contact with her as she makes observations and asks questions, whereas others invite her to play with them. In imaginative and role-play scenarios, Wroton might ask her child clients, “What could have gone differently?” or “What do you wish had gone differently?” Their answers, along with the scene they have acted out previously, can provide clues about the issues troubling these children. For example, repeatedly arranging toy figures with a “bad guy” in the scene might indicate that a child is struggling with trauma or violence from his or her past. Cochran and his wife, Nancy, both specialize in child-centered play therapy and together present trainings and workshops on the topic. They co-led an education session titled “Growing play therapy up for older children, adolescents and adults” at the ACA 2018 Conference & Expo in Atlanta this past spring. In fact, the crux of what makes play therapy so effective — and different from most other counseling methods — is that it is directed by the client, the Cochrans assert. Play therapists don’t suggest that clients play with a certain toy or work on a presenting problem. Instead, play therapists offer warmth, empathy and a gentle structure for clients to make their own meaning through the exploration and play they chose to engage in. In play therapy, Jeff explains, the counselor sets up the process that leads to self-discovery on the part of the client. “You let the process teach them,” he says. Play therapy gives clients a safe space to explore what it feels like to be in control, she adds, with learning opportunities presenting themselves at every turn. 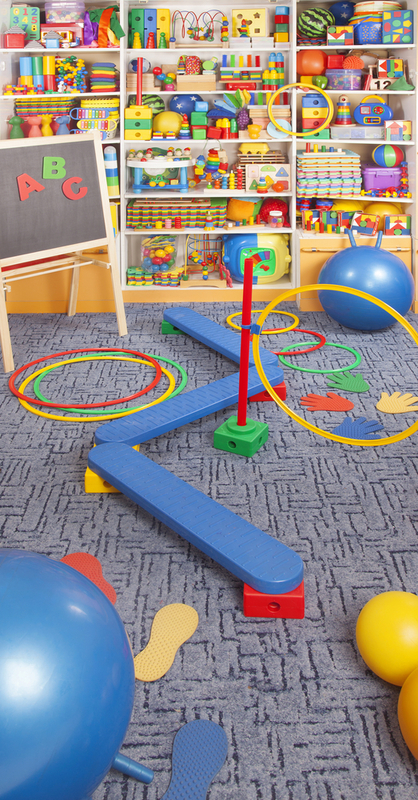 As young clients try out the various toys in the playroom, they are learning what they do and don’t like, explains Nancy, an adjunct assistant professor in the Department of Educational Psychology and Counseling at the University of Tennessee. They can also push against preconceived ideas — whether of their own making or instilled in them by others — of what they are and aren’t good at. In the process, Jeff adds, these clients are learning not only that they can play the xylophone, for example, but that they can take on a challenge and master it. One of the Cochrans’ graduate students worked with a child referred to play therapy because he was exhibiting obstinate behavior at preschool and not connecting with classmates. The 4-year-old had experienced abuse in his past, and his fear of taking risks discouraged him from trying new things or learning at school. Nancy says that the boy was nonverbal until the 10th session of play therapy. In his first appointment, the boy was withdrawn and anxious, alternately slouching against the wall, crawling underneath a rug and hiding behind a shelf of toy bins for much of the session. Throughout the session, the Cochrans’ graduate counseling student offered gentle narration, such as “You’re not too sure about this” and “This is difficult for you.” She stayed with him, talking him through the process, which showed that she was committed to allowing him to choose how to proceed in his playtime, Nancy says. Afterward, the graduate student confided to Nancy that she thought she had failed and had just made the young boy miserable. When they went back and watched video footage of the session together, however, Nancy pointed out something that the counseling student had missed. The boy had repeatedly tossed toys out from behind the shelf where he was hiding, but in the very last minute of the session, he found a pair of toy binoculars and had looked through them directly at the counseling student. Over the course of therapy, the young client opened up more and more. At the second and following sessions, he went behind the shelf and dumped toys out, both to explore and to see how the student counselor would react. He later gravitated to self-expressive work in a sand tray and used the counselor as an ally as he fought with a punching bag and engaged in imaginative role-play and rescue schemes. Eventually, the boy and the counselor played together, with the boy proudly setting up challenges and showing off his skills tossing balls into a toy bin. The client was in foster care, and over the course of therapy, his play evolved from symbolic to direct expression as he drew pictures of what he wanted his family to look like, Nancy adds. Jeff acknowledges that play therapy’s power of self-discovery “sounds deceptively simple. … It’s hard to believe it can be so impactful.” However, through play, clients are able to examine themselves and push limits to discover patterns of repeated mistakes and blind spots. For example, a play therapist might see young clients use a doll to act out, fluctuating between caring and nurturing behaviors and hurtful behaviors. Jeff says the counselor can narrate with empathy, accepting all play behaviors and attending to the child’s process as the child makes choices of how she or he wants to be in life. Ray, an ACA fellow and a professor in the counseling program at the University of North Texas, is a registered play therapist and a certified supervisor in both child-centered play therapy and child-parent relationship therapy. She estimates that roughly 70 percent of a play therapist’s work is nonverbal and 30 percent is verbal. When play therapy practitioners do speak, it is typically to offer reflection and encouragement on the play they are observing or to offer guidance such as setting limits, she says. “If [the child client] is depending on an adult to make decisions, I would respond, ‘In here, it’s up to you.’ If they’re asking, ‘How do I spell this?’ or ‘How do I draw this?’ the answer would be, ‘In here, you can draw or spell it any way you want to,’” Ray says. When a young client becomes angry or tests limits, the counselor can recognize how the client is feeling and redirect the behavior. For example, when the child gets agitated, the play therapist can suggest that rather than drawing on the wall, they draw together on paper, rip the paper or punch a punching bag, Ray says. This type of limit setting emphasizes that the child’s feelings are valid, Ray explains. It also sends the message that the child’s behavior — not the child himself or herself — is the problem and that there are always other ways of expressing strong feelings through an acceptable behavior. If a counselor presents the limit as “You can’t,” it implies that something about the child is not OK, Ray says. This type of response also might engage the child in a power struggle with the counselor by personalizing the expression of the feeling, she explains. Children will naturally bump up against limits as a form of exploration, so play therapists will often see young clients who want to climb on things, break toys or exhibit other destructive behaviors, Jeff Cochran says. As with so many aspects of play therapy, the manner in which the counselor diffuses these urges can be an opportunity for self-discovery. “We start with a simple opening message: ‘In this room, you can say anything you want and do almost anything you want, and if there’s something that’s not OK to do, I will tell you,’” Cochran says. The growth and learning that begin in play therapy naturally carry over and are applied elsewhere in clients’ lives, Wroton says. In other words, the “work” of play therapy continues, even if the play therapist doesn’t observe a direct cause and effect in sessions, she says. Wroton remembers one client, a 9-year-old boy, who had been adopted after going through the foster care system. Before being removed from his birth home, he had been exposed to graphic sexual content, anger, violence and alcohol abuse. In play therapy, he responded well and gravitated to making scenes in a sand tray. Wroton told the boy, “I want to know what it’s like to be in your world.” Repeatedly, he would respond to this prompt by creating a scene that involved a king figure and several blue Smurfs. He would bury and uncover the Smurfs, and then rebury them. When he was finally finished making his scene, the Smurfs would always remain buried beneath the sand. They weren’t uncovered until it was time to clean up, Wroton says. The boy didn’t identify who or what these figures might represent, simply referring to them as “Smurfs,” she adds. Then, one day, something changed for the client: He buried and reburied the Smurfs like usual, but he also buried the king and left him beneath the sand. Afterward, Wroton received a call from the client’s adoptive mother. 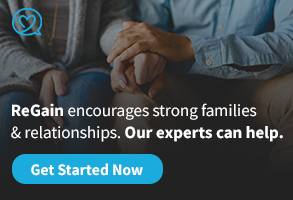 Her son, who previously had never talked much about his past, was suddenly opening up and connecting more with her. Wroton thinks the Smurfs and king figure in the boy’s sand tray scenes represented experiences and feelings that the young client had tucked away — including family members who were abusive yet for whom he also held some positive memories. Through the sand tray, he was processing these feelings and coming to terms with what the memories meant to him. The self-directive aspect of play therapy reached one of Ray’s clients in ways that other more direct methods might have failed to do. The 8-year-old girl was referred to Ray by her school because of aggressive behavior, which included being suspended after trying to hit her teacher. However, in play therapy, the girl never mentioned any anger regarding school, her teacher or her classmates. Instead, she played out scenes from her family and home life, where, it turns out, she was being abused. In play therapy sessions with Ray, the client gravitated toward drawing her family and setting up scenes with figures in a dollhouse. As the characters in the dollhouse would interact, the girl would exhibit what Ray calls a “play disruption.” In the middle of a dollhouse scene, the girl would become more active and move through the room, often throwing or trying to break things. After directing her energy and aggression in this way, she was able to finish her scene in the dollhouse. The girl wasn’t willing to talk with anyone about her family issues at school. The style of her play in play therapy, however, was an outlet for her to communicate and process what was happening. The young client talked about specific abuses that were happening at home during the family scenes she played out in therapy, Ray says. Once the root of the child’s struggles became clear, Ray took the necessary steps to report the suspected abuse, documenting what the client had verbalized in session. Through play, the client formed a therapeutic bond with Ray and was able to work through what was troubling her. As a result, the child’s aggressive behavior at school dissipated. Missy Galica, an ACA member and LPC intern in Lubbock, Texas, uses sand tray therapy in her work with adult clients, including college students from Texas Tech University. The medium can be particularly helpful for clients of any age who are struggling to find the words to articulate how they are feeling, she says. What brings many of Galica’s college-age clients to counseling are academic struggles. By creating scenes in a sand tray, the students are often able to work through nonacademic issues that are troubling them and spilling over into their behavior and schoolwork. 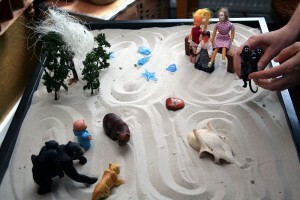 As is the case with child-centered play therapy, sand tray work is nondirective. The client chooses what gets made in the sand tray and the meaning attached to it. Counselors should be careful to prompt clients to describe and talk about the scenes they have made in the sand tray without interjecting their own observations, Galica emphasizes. As part of the meaning-making process, Galica takes photos of each scene after clients finish their sand trays. Later, they look at the photos together, talk about the progress the client has made and discuss how the person’s sand tray scenes have evolved. This is also a good way to track and prompt discussions of representations that come up repeatedly with clients, Galica says. Clients often have to take some time to think it through before they can explain the scenes they have created in their sand trays. Many times, Galica says, issues and challenges that have been troubling clients don’t become clear to them until they see the issues played out in a sand tray. For example, a client who is feeling overwhelmed with school or home life might put figures all in a jumble on top of one another. Or a client may use one object to represent themselves and place another object or objects at a distance or facing away from them. In this case, the client may be struggling with loss, attachment issues or fear of letting loved ones down. Ultimately, however, it is up to the client — not the counselor — to discover and talk through the issue that has taken shape in the sand tray. At the same time, the counselor provides the prompting and support to help and encourage the client, Galica says. Galica recalls a particular client whose parents wanted him to become an engineer and were paying his way through college. He hated his engineering courses, however, and harbored a desire to become a jazz musician. This had manifested into academic and other struggles while he was away from home. When the client made sand tray scenes, he often placed a female figure at a distance from the figure he used to represent himself. After multiple sand trays and discussions, it became clear that the client was terrified to tell his mother he didn’t want to be an engineer. Galica began to focus on that fear with the client, asking him to express his feelings in a draft letter to his parents. She also had him speak to an empty chair as if his mother were there, which is a technique often used in Gestalt therapy. It took the student the entire semester before he felt prepared to tell his parents about his own dreams for his future. As clients play out situations in sand trays, Galica asks them to show her what they would want life to look like if they had a magic wand to fix everything they were struggling with. What would a resolution look like? What would it look like in five, 10 or 20 years? From there, Galica and her clients talk through the issues and consider options for arriving at realistic resolutions. Galica says sand trays can easily be used in conjunction with any modality to which a counselor is loyal. She regularly uses them along with cognitive behavior therapy for her college-age clients. Another benefit, she notes, is that the materials are readily available and easily transportable. Practitioners can pick up a plastic tray, sand and small figurines at any big box or craft supply store. Sand tray work is a method that many counselors might not consider for adult clients “because we’re culturally conditioned [to think] that we don’t play after a certain age,” Galica says. However, sand tray work is very accessible (for both counselor and client), creative and versatile, she asserts. It’s often said that play therapy reaches young clients through their own natural “language” of play. When combined with tenets of the Adlerian method, play therapy becomes a tool for the therapist to build an egalitarian relationship with the client while focusing on the individual and his or her dynamics with others, according to Terry Kottman and Kristin Meany-Walen, co-authors of Partners in Play: An Adlerian Approach to Play Therapy. Meany-Walen, an assistant professor of counseling at the University of Northern Iowa, and Kottman, who runs a play therapy counseling, training and workshop center in Cedar Falls, Iowa, are both licensed mental health counselors and registered play therapists. 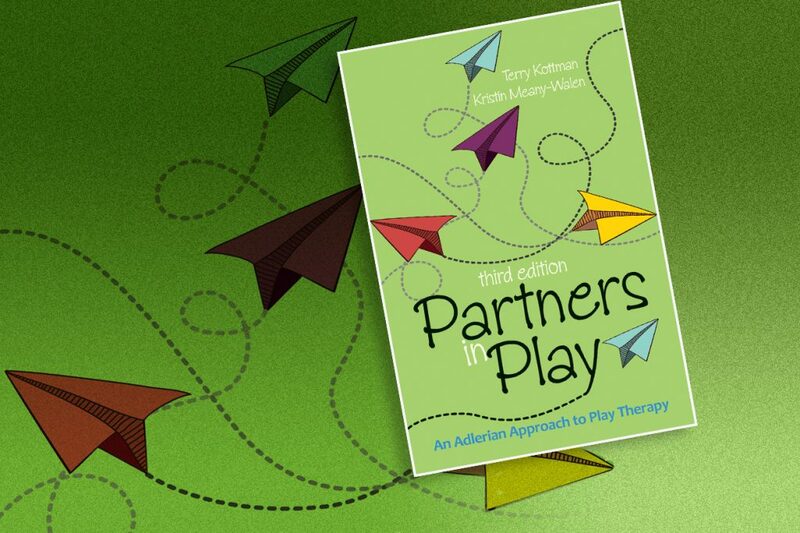 The third edition of Partners in Play was published earlier this year by the American Counseling Association. Q+A: CT Online contacted Kottman and Meany-Walen recently to learn more about this unique approach. Their responses are co-written, except where noted. Your book focuses on Adlerian play therapy, which combines play therapy techniques with the Adlerian method. Why do you think they are a good fit? Why does that combination work to help young clients? Adlerian psychology has a clear and easy-to-follow way to conceptualize clients and figure out what is “underneath” the presenting problem. Before the development of Adlerian play therapy, there was no precedent for working with individual child clients, nor was there a precedent for using play as a treatment modality using Adlerian psychology. We believe that combining Adlerian psychology with play therapy was a logical way to capitalize on the Adlerian methodology for conceptualizing and developing a treatment plan [while] at the same time using play, the “natural” language of children, to communicate with them. 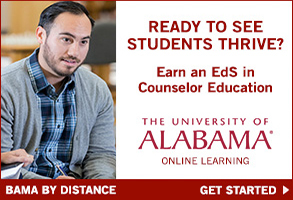 What are some key takeaways that you want counselors to know about this topic? 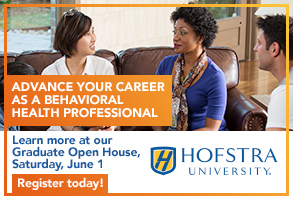 We want counselors to learn about the myriads of ways of using play, art techniques, sand tray, active games, movement and dance, bibliotherapy and therapeutic storytelling as a vehicle for helping children, adolescents, parents and family members to grow in positive directions. We believe that the four-phase model of Adlerian or Individual Psychology — building a relationship with the client, exploring the client’s lifestyle, helping the client gain insight into his or her lifestyle, and learning and practicing new skills — is an amazing vehicle for working with clients. We value the systematic way Adlerian counselors conceptualize clients — looking at assets and strengths, interpersonal dynamics, intrapersonal dynamics (like personality priorities, Crucial C’s*, goals of misbehavior, mastery of the life tasks), problem-solving skills, self-defeating thought patterns and so forth — as a way to determine the best way to decide on the direction and structure of the therapeutic process. * The Crucial C’s are one method that Adlerians use to conceptualize clients. They were developed by Amy Lew and Betty Lou Bettner, who suggest that all people need to have courage (the willingness to try new things without a guarantee of success), connect (the desire and ability to build relationships with other people), be capable (the belief that they are able to master ideas and skills) and count (the belief that they are valuable and special without having to earn love or worthiness). How does Adlerian play therapy fit with your personality and style as a counselor? What made you want to specialize in this area? I (Terry) am a very encouraging and exuberant person. Adlerian play therapy reflects my personality by being positive and playful. I was drawn to Adlerian psychology because it is so focused on the strengths of the client, which is exactly what I wanted to do when I became a counselor. I love playing, have always loved playing and had spent my whole life working with children in some capacity. When I was in high school, I worked part time in a pediatrician’s office. When I was in college, I taught swimming lessons to young children and volunteered in an after-school program for children who came from low-income families. I got my first master’s degree in elementary teaching and my second master’s degree in special education. I loved working with children in schools. It was a natural transition for me to work as a school counselor and to become a play therapist. Adlerian play therapy was also a natural fit for me (Kristin). I had often considered the experiences of my youth, and my perceptions of those experiences, as instrumental in shaping who I was as an adult. I explored many different counseling theories, and Adlerian psychology was most consistent with how I understand people and how I want to work with them. The systematic way of understanding people’s ways of belonging and operating in the world, from an Adlerian perspective, helps me to feel organized and productive, both of which are important parts of my lifestyle. By happenstance, I took a class from (co-author) Terry Kottman where I began learning about the value and art of play therapy. I started to use some of the play therapy concepts with my own child, who was 8 years old at the time. I noticed drastic improvements in his mood, his behaviors and our relationship. I wanted to help other children and families in the same way. One of the things that prompted you to write the first edition of this title (in 1995) was a rising interest in play therapy. Two decades later, is the field still growing? Yes, it is. The field of play therapy continues to grow, with the Association for Play Therapy growing from 3,346 members in 1998 to 6,166 members in 2015, increasing at the rate of about 1.5 percent each year. There is a wider understanding of the importance of credentialing of play therapists (registered play therapists, or RPTs) among mental health professionals and with the public. What is one thing you wish you knew about play therapy as a new counselor? What advice would you give to recent counseling graduates who are starting out and are interested in play therapy? I (Terry) wish I had known that play therapy was not just for children — that teens, adults and members of families can also benefit from using play therapy skills and techniques (including art techniques, sand tray, active games, movement and dance, bibliotherapy and therapeutic storytelling) as a way to express themselves, explore their issues, gain insight, and learn and practice new ways of communicating, solving problems and interacting with others. The advice I would give recent counseling grads who are starting a career in play therapy is to obtain really good training in play therapy. I believe it is essential to explore the different approaches to play therapy and find one that fits with your personality and what you believe about how personalities form and how people change. After that, find training that includes being observed with children and getting feedback about your skills and abilities. What prompted you to create a third edition of this title? What new information will readers find? 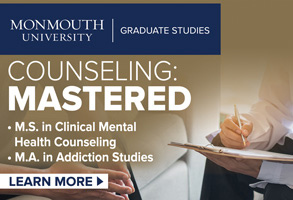 The counseling field continues to evolve as we make discoveries and learn from our experiences. We wanted to provide updated information about play therapy, counseling and how the two merge. Since the last edition, we have seen an increase in the importance of evidence-based treatments and research. In the current edition, we include information about some of our ideas of researching Adlerian play therapy as well as published accounts of Adlerian play therapy. We also included various resources for readers such a list of activities to use with children and informal assessments to use with children, parents or teachers. In addition to your book, what resources would you recommend for counselors who want to learn more about play therapy? For beginning play therapists who want to know about play therapy skills, another book I (Terry) wrote that is published by ACA would be a good resource: Play Therapy: Basics and Beyond (second edition). Another excellent resource is the website of the Association for Play Therapy (www.a4pt.org). Do preteens still play in counseling? As a play therapist, I’m used to explaining the ins and outs of play therapy. Because play is a universal concept, most people understand that it is also a child’s “language” and can be used to address many issues in therapy. However, when it comes to preteens, play therapy takes a slight shift. Whereas children don’t always have the ability to articulate their thoughts and feelings, preteens are becoming more able to hold conversations about important issues. They can still become very uncomfortable, however, if they have to sit across from an adult for a “serious” talk. Plus, by the time most preteens come to counseling, they’ve heard a lot of talking already. Play is still very important to preteens, although it starts to look a little different. As children mature, activities move away from fantasy play to more structured games. Still, children of this age often feel trapped between childhood and the teen years. In play therapy, preteens often vacillate between play that is more common to younger children and activities that appeal more to teenagers. At our counseling practice, we often use games and interactive activities to take the pressure off. Preteens enjoy both regular board and card games and also specialized therapeutic games. Games can be used to deal with anxiety, power and control issues, self-esteem, relationships and difficult behaviors. Specialized therapeutic games address topic areas such as depression, anger, anxiety, aggression, life changes, coping skills and much more. Skilled play therapists can use almost any game to address difficult issues with children and teenagers. Preteens are also developing creative skills. They are moving into using abstract thought as life opens up to endless possibilities. Expressive arts are a great tool to address new thoughts and feelings. Using specific art materials, clients build, sculpt or draw to represent their struggles and find alternative solutions. miniatures with a few guidelines that make the activity feel challenging. Sand tray therapy is a great way to allow kids in early adolescence to work through their issues without feeling pressured or judged. Additionally, interactive activities can be used to teach mindfulness meditation skills. By learning to direct their breathing and use creative imagery, kids become more aware of their feelings and what’s behind them. By recognizing intense emotions, they are better able to control them and listen to what these feelings are trying to say to them. In conclusion, preteens are balancing child’s play and teen activities. 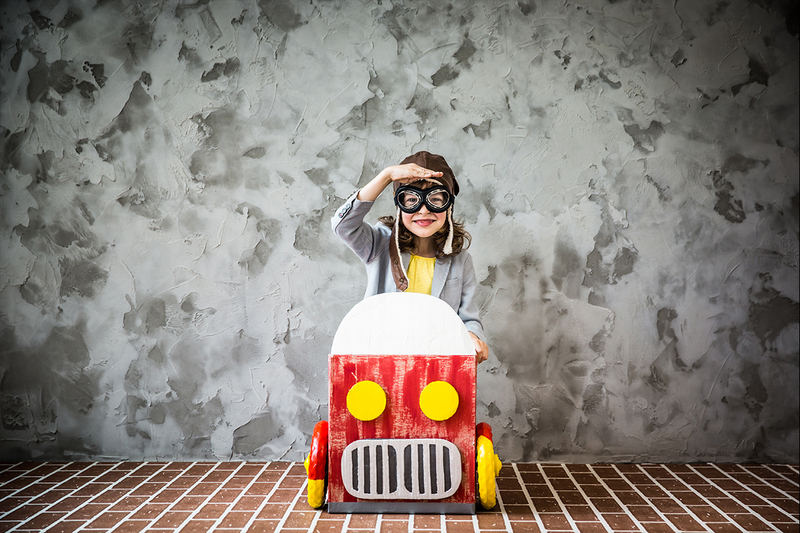 Given enough freedom, children of this age group may allow themselves to delve into pretend play, dressing up or other activities that are more typical for younger children. On the other hand, they also like the challenge of activities that are considered to be more grown-up. Maintaining this balance requires their counselors to maintain a great level of flexibility and a nonjudgmental attitude. As a result, preteens will know that counseling is a place where they can use any of their internal resources at any time to address any issue at hand. Mark Loewen is a licensed professional counselor, registered play therapist and parent coach in Richmond, Virginia. He is the owner of LaunchPad Counseling (launchpadcounseling.com), a practice that helps children, teens and parents cultivate their inner resources to overcome stressful circumstances. 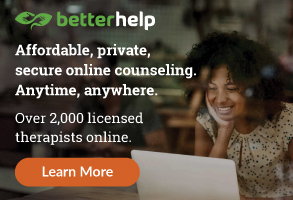 Contact him at mark@launchpadcounseling.com.